Stretching in a graceful curve nearly three quarters of a mile is one of the most beautiful strands of beach in New England, if not the entire United States! Flanked by two protective promontories – Eagle Head to the North, and Pickwith Point to the south – Singing Beach is renowned for the unique texture of its fine white sand. When ocean bathing became popular in the late 19th century, visitors discovered our beach has another unique characteristic – the sands produce a magical musical sound when walked upon! Do Our Sands Really Sing? First-time visitors to Singing Beach, expecting to hear a melody as they cross the sand are probably in for a disappointment. Our famous beach squeaks rather than sings! Originally known as “Neck” or Old Neck” beach, Singing Beach got its now famous name in the mid-19th century when it became a popular destination for local bathers. One local legend says a distinct sound was first noted as the leather shoes of nannies escorting youngsters scuffed across the sand. “It gives the beach a character all of its own” and is due Dr. Block explains, to the qualities of the sand itself, “angular and spherically shaped grains with a lack of impurities”. For well over a century they have come to Singing Beach, by carriage, by bicycle, on foot, in early autos and more recently by train. At first well-dressed ladies and gentlemen in their Sunday finery, nannies with their precious charges, guests staying at the grand Masconomo House hotel, and even members of the many foreign embassies that relocated from Washington D.C. to Manchester during the hot and humid days of summer. For those not inclined to brave the chilly waters of the Atlantic, visitors enjoyed simply “taking the air” in “proper attire”. For the swimmers however, it was blouses and bloomers for the ladies, itchy wool one-piece bathing suits for the gents. Over time of course, a far more diverse and relaxed “clientele” has discovered that Singing Beach is still the place to be, to see, and to be seen! Plate with hand-painted view of Eagle head, a distinctive feature of Singing Beach that appeared often on souvenir china as well as postcards such as you see here. In the 1950’s the local Red Cross sponsored swimming lessons at Singing Beach. These three Swimming Race ribbons were won by current Selectman Tom Kehoe in the late 1950’s. Vintage stereoscope with stereopticon card showing viewer a 3-D look of Singing Beach. This large souvenir platter features a transfer print view of the many bath houses lining Singing Beach. It was made in Austria to be sold in the local drug store of Andrew Lee and Son on the corner of School and Union Streets. 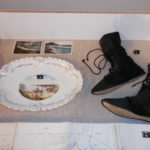 Pair of woman’s cotton sateen bathing boots with canvas soles. Worn when wading in the ocean during the 1920’s. 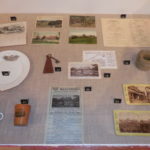 Wenham Museum collection. This colorful souvenir plate is another Austrian piece, made for the local variety store of Benjamin Allen which once stood next to the First Parish Church. This Sterling silver souvenir spoon is engraved with a view of Eagle Head and the inscription “Manchester- by-the-Sea”. After its purchase the spoon was personalized with the name “Laura”. On the back is the date of the engraving – “July 24th, 1892”. Swimming or “bathing” in the ocean was unheard-of until the mid-18th century when several British doctors first recommended the practice as therapeutic. It took British Royalty however, to popularize the activity. In 1789 George III and his court went bathing with “dippers” – attendants who plunged the bathers’ heads underwater for the requisite one to three dips! With the rise of the middle class in the 1800’s, more time and money was being spent on recreation, and the seaside proved especially appealing. 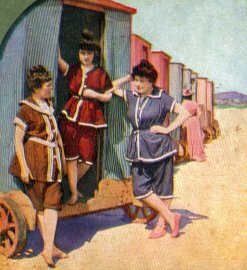 Popular during the Victorian Era were “Bathing “Machines” – small cabins on wheels. Inside bathers could change discretely into their swim wear while the “machines” were being rolled into the sea. This practice stopped around 1890, when the “machines” – wheels removed – simply remained on shore as bath houses. Bath houses first appeared in America at the seaside resorts along the New England coast in the 1850’s. Here in Manchester, bathers initially changed in tents pitched along Singing Beach. In the 1880’s, these were replaced by small wooden shacks providing privacy for the donning of swim wear – blouses, bloomers, long stockings for their ladies; woolen tank tops for the gents. Soon, the entire length of Singing Beach was lined with bath houses fronted by a wooden boardwalk. Not everyone was happy with the barricade of bath houses lining Singing Beach, especially abutters who believed their properties included the beach itself! One abutter who took particular offense to the row of “shanties” spoiling his view was a Mr. Slater. He took his case to the Superior Court in an action called “The Inhabitants of Manchester vs. Andrew C. Slater”. The Judge ruled in favor of Mr. Slater and all other property owners, determining that they, not Town of Manchester owned Singing Beach! The public was furious and various committees were formed in an attempt to purchase the beach back from those property owners. This effort failed, but in 1898, taking advantage of provisions in the Commonwealth’s “Parks Act”, the town was able to acquire the beach for “park purposes” meaning it would be open to the general public forever. The acquisition cost the town $11,434.02. Today, that would be about a $4 million expense to local tax-payers! 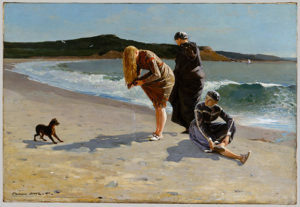 Singing Beach was the center of another controversy shortly after this lovely view of Eagle head was painted by renowned American artist Winslow Homer in 1870. 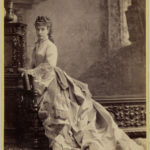 When first exhibited at the National Academy of Design in New York it drew mixed reviews from the critics, many of whom were offended by the scanty attire of the subjects and the work’s “frank sexuality”. 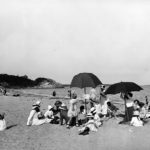 In the late 19th Century, improved rail service and the lure of Singing Beach helped transform Manchester-by-the-Sea into a popular summer resort destination. Many visitors came to spend their vacation at the magnificent Masconomo House overlooking Singing Beach. 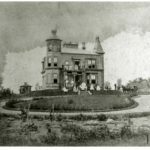 It was built in 1878 by newlyweds Agnes and Junius Booth Jr. who simply attached a 230 foot long, three-story hotel to their existing cottage which stood at the corner of Masconomo and Beach Streets. The Masconomo House had 103 rooms and could seat 300 in its ornate dining room. 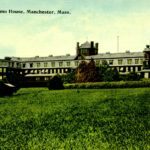 On the 12-acre property were detached guest houses, tennis courts, a working farm, windmill, ice house, an enormous stable and quarters for the large staff. In addition to tennis, guests could enjoy bowling, billiards, boating, horseback rides, performances in a separate concert hall, and of course easy access to beautiful Singing Beach – all for a modest $3.50 a day! The Masconomo House remained in operation until 1919 when much of it was destroyed by fire. A year later, what remained of the hotel was razed, leaving only the original Booth cottage still standing. It remains a private home today. Junius and Agnes Perry Booth both came from the world of the theatre. 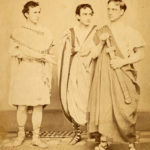 Junius was one of three sons of famous Shakespearian actor Junius Brutus Booth, Sr. The three brothers (seen above) – Junius Jr., Edward and the infamous John Wlkes Booth Jr, were all actors as well. The eldest son, Junius Jr. was the least talented, his interest more in theatre management and promotion. In 1869, Junius and his new wife (25 years his junior!) moved to Manchester, built the ornate cottage shown below, and quickly became part of a flourishing colony of writers, artists and thespians. This was a second marriage for them both. Agnes, an Australian, came to America early in life, making her stage debut at age 12 as a dancer. By the time she married Junius in 1867, she was considered one of greatest actresses in America. The two proved a formidable team, operating the Masconomo House profitably for five years before Junius’ death in 1883. Agnes soon married for a third and final time. Her new husband and business partner was John B. Schoeffel, an old family friend and former manager of Boston’s famous Tremont Theatre. Under their management the Masconomo House enjoyed its busiest and brightest years! 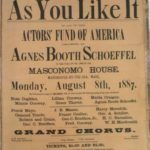 Theatre history was made on August 8, 1887 when Agnes Booth Schoeffel produced and starred in an evening performance of Shakespeare’s “As You Like It” on the front lawn of the Masconomo House. It was the first time a professional theatrical production had ever been performed out of doors in America! As the promotional poster indicates, the play was to raise funds to support the Actors’ Fund of America. The performance was a huge success! Hundreds arrived by train from Boston and New York, streamed up Beach Street from the depot and gathered before a stage illuminated by calcium lights, locomotive lamps and special electrified Chinese lanterns. The following year, a second outdoor performance was staged, this time Shakespeare’s “Midsummer Night’s Dream”. 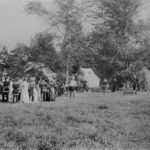 The photo below shows a costumed cast on the lawn of the Masconomo House, perhaps at a dress rehearsal for one of the historic pastoral performances. Post cards showing various views of hotel and grounds were especially popular. Letter written in 1884 on ornate hotel stationery. Dinner menu and wine list, 1880. Promotional piece including views of Cape Ann landmarks. 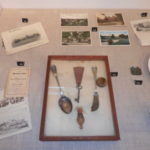 Collection of artifacts from the Masconomo House including room key, silverware, and souvenir cork and pin box. 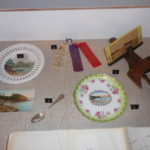 These items were accumulated by the current owners of the original Booth Cottage. Metal tag for a hotel room key found in the sands of Singing Beach. Key to room 142. Leather tag instructs finder to return key by mail. Front and back views of promotional piece in use after the Booths had passed on and hotel was in final years of operation. Souvenir wooden butter tub with transfer print of hotel. Gold rimmed souvenir tumbler and tea cup with transfer print of hotel. These were made in England for sale in the drug store of A. Lee & Son in downtown Manchester. Souvenir wooden tumbler with transfer print of hotel. This was made in Scotland and is a good example of Mauchline Ware, using wood from the sycamore tree, also known as Scots Plane. Another advertising piece for the Masconomo House during its final years. Note that special discounted rates are being offered to “Motorists”. Two stereopticon cards showing interior courtyard and facade of the Masconomo House. 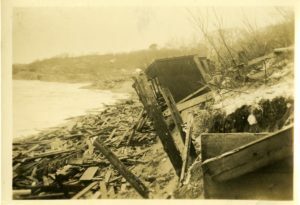 Starting on Thursday, January 26, 1933 and lasting through Saturday the 28th, a powerful winter storm battered the beaches of Magnolia and Manchester. The combination of strong winds, a high tide and spectacular surf was more than enough to destroy nearly every bath house along Singing Beach. Fifty years later Ed Corley, then a 10-year old, recalled the scene. ”I was shocked when we got our first glimpse of the beach – or I should say the ocean, as there was no longer a beach. The water was up to and beyond the neat, small private bath houses which were rapidly disappearing into the raging surf. Many of the bath houses that survived were moved off-site and converted into garden sheds, play houses and utility buildings. One even ended up in New Hampshire as a privy! Five years later, came the knockout punch – the horrific Hurricane of 1938, one of the fiercest tropical cyclones to ever ravage New England. Most of the remaining bath houses didn’t stand a chance and with their destruction, the “Bath House Era” at Singing Beach came to an abrupt end. A few were salvaged however, including one now on the grounds of the Manchester Historical Museum. 10,000 Years Ago – Beach formed during Last Glacial Age. 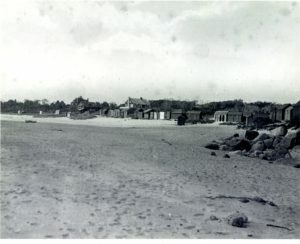 1878 – Masconomo House Hotel built overlooking “Neck Beach”. 1880 – First private bath houses erected along perimeter of beach. 1896 – State Supreme Court rules beach is owned by abutters not the general public. 1898 – Town challenges ruling and under provisions of the Massachusetts “Parks Act” buys back the beach from the abutters. Singing Beach now town property. 1919 – Fire destroys much of Masconomo House. 1920 – Masconomo House razed, marking end of the “Gilded Age in Manchester-by-the-Sea. 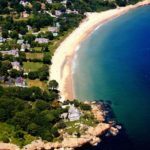 1931 – Singing Beach Trust buys entire Masconomo House property to protect against possible development. 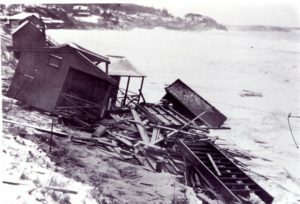 1933 – A ferocious winter batters the beach destroying most of the private bath houses, the boardwalk and the Town Bath House, the structure originally built for the private use of Masconomo House guests. 1933 – Singing Beach Club incorporates, acquires part of the Trust land for its clubhouse and also funds re-construction of the Town Bath House. 1938 – The legendary Hurricane of 1938 batters New England leveling most remaining bath houses. 1978 – The Great Blizzard of ‘78 carries sand out to sea and destroys the Rip Rap wall and Town Bath House. 1978 – U.S. Corps of Engineers restores Singing Beach. 1991 – User fees for Singing Beach inaugurated.